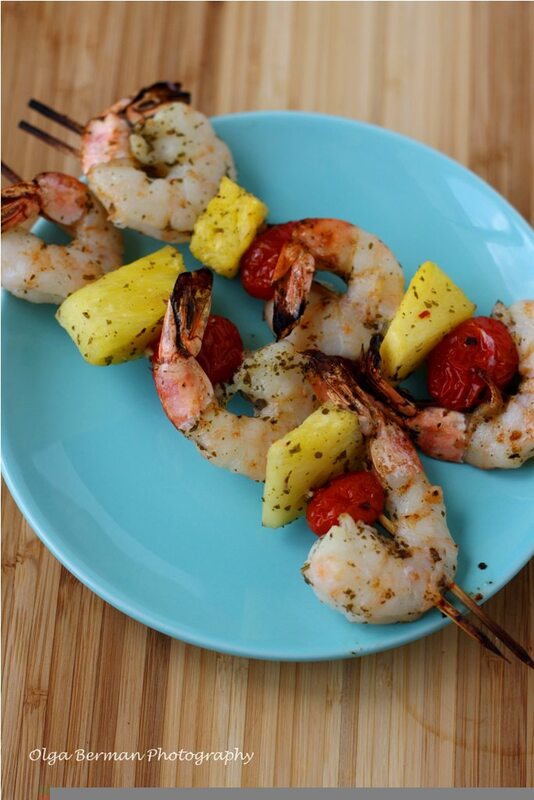 Enliven your dinner tonight with this delightful recipe for shrimp and pineapple skewers, courtesy of Robyn Webb! 1. Soak the wooden skewers in a shallow pan of hot water for 1 hour or more. 2. Add the shrimp and pineapple chunks to a bowl. Add in the Chimichurri Sauce, cover and marinate in the refrigerator for 1 hour. 3. Remove the shrimp and pineapple from the refrigerator. Add the grape tomatoes to the mixture to coat the tomatoes with the sauce. 4. Preheat an oven broiler with the rack set 6 inches from the heat source. Coat a broiler tray with cooking spray. Or preheat an outdoor grill set to medium. Coat the grill rack with cooking spray. Using 2 skewers per kebab, thread the shrimp, pineapple and cherry tomatoes evenly among all the skewers. Thread them from one end of the food to the other so the food stays flat and does not twirl during cooking. 5. Broil the shrimp kebabs for about 3 minutes per side or until shrimp are cooked through and pineapple and tomatoes are lightly browned.